Pick up from Port Blair Airport in the morning & transfer to hotel. 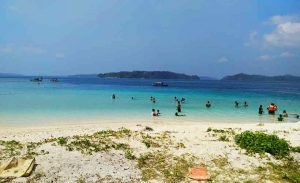 After Lunch proceed for the nearest Beach (9Kms) from Port Blair. The Crescent shaped Corbyns Cove ideal for swimming & Bathing. In the evening attend the enthralling Sound and Light Show at Cellular Jail. Night stay at hotel. After Breakfast visit the Administrative Capital Prior to Independence from where the Britishers governed the entire A & N Islands-ROSSISLAND, A destination for Nature Walk amidst friendly Deers & Peacocks.Smritika Museum,records the life of its political prisoners. Excursion to North Bay( Coral Island)with Glass Bottom Ride & Snorkeling one can explore the Coral reefs underneath. Harbour Crusing,visit the Viper Island named after A British Shipping Vessel that wreaked off its Shore.Its History involves the local prison which was built in 1867,whos heart touching gallows & torture posts still can be seen.Night stay at hotel. 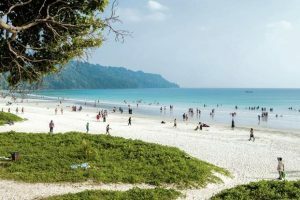 Havelock Island,54 Kms from Port Blair is the most popular among visitors as it is developed as per the requirement of the tourists. Catch the morning ferry to Havelock.visit, visit the famous RadhanagarBeach,has been marked as one of the best in Asia. Overnight stay at Havelock in a sandy Beach Resort. After Breakfast check out from hotel. Spend the leisure time at the adjacent Beach.Catch the afternoon ferry for Port Blair. (OPTIONAL-visit the Elephant Beach for Snorkeling/Glass bottom ride. One can explore the underwater Marine life with variety of colour Fishes and Corals). Night stay in hotel at Port Blair. After Breakfast Sight seeing Port Blair, visit the National Memorial-Cellular Jail, Designed specially for solitary confinement it earned the Islands the dreded name of Kala Pani, One of the oldest & Asias largest- Chatam Shaw Mill ,established by Britishers in 1836.Anthrolopological Museum Sheds Light on the Islands Tribal Inhabitants, Fisharies Museam displays hundreds of species of unusual Fish,Corals & Shells, Samudrika-Naval Marine Museum has superb display of marine Life, Sagarika.The Cottage Industry for shopping. 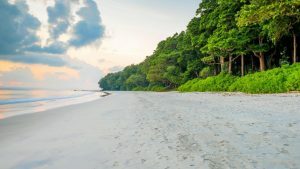 After Lunch visit Chidiya Tapu- The Southernmost tip of South Andaman bout 31 kms from Port Blair- generally known as the Bird Island covered with lush green mangroves and beautiful beach with breath taking sunset – all of which creates a mesmerizing environment. Optional Activities- Swimming, Trekking & picnic spot.Night stay at hotel. Transfer to Airport at appropriate time. Non Alcoholic welcome drink on arrival at the Hotel. Daily Breakfast at Port Blair and Havelock. All Excursions in a general ferry. Meet and Greet on arrival / departure. If you’d like to chat about India or need help finding a holiday to suit you we’re very happy to help. Ghum India Ghum is one of the leading travel company in Delhi which offers tours for all parts of India. We have our destination expert for all important destinations in India and Abroad. Our journey started in 2014 with a prime motive of providing hassle free services to all our guests. Hey There. I foun your blog using msn. This is an extremely well written article. Nice site, nice and easy on the eyes and fantastic content too. I understand your point, and I entirely love your article. For what its really worth I will tell all my friends about it, very creative. I am constantly web surfing for ideas that will benefit me. Hey there! Great stuff, please keep me posted any time you post something like this! superb job on the content. Terrific article. I thank you for sharing it to us. I have learned so much. I am lucky that I found this web blog, precisely the proper information that I was searching for! just the best info that I was searching for! site. Looking over this info made me discovered just what I wanted. A lot of thanks for each of your efforts on this blog. some other people about this idea plus my simple princess is becoming educated a whole lot. Definitely, what a great blog and informative posts, I definitely will bookmark your site.All the Best! Hello,I log on to your new stuff named “Best of Andaman Tour Packages Starting @ ₹15,999 – Ghum India Ghum” like every week.Your humoristic style is witty, keep up the good work! And you can look our website about تحميل اغانى. did you customize it yourself? Either way keep up the nice high quality writing, it’s rare to see a great weblog like this one today.. Outstanding information it is really. We have been awaiting for this tips. me tremendously. Thanks for all of your time & work. but other than that, that is fantastic blog. An excellent read. and may come back very soon. I want to encourage you to definitely continue your great posts, have a nice day! that’s both equally educative and amusing, and without a doubt, you’ve hit the nail on the head. If you want to grow your knowledge only keep visiting this website and be updated with the latest news posted here. Definitely wonderful information can be seen on this web blog. I must say you have hi quality posts here. Your page should go viral. I intended to post you that very small remark to be able to say thank you over again for all the superb things you’ve featured on this page. It has been quite surprisingly open-handed of you in giving without restraint exactly what a lot of folks could have distributed for an e book to help with making some bucks on their own, primarily since you might have tried it if you ever considered necessary. The good ideas likewise worked like a fantastic way to fully grasp other individuals have similar zeal really like mine to know the truth a great deal more concerning this condition. I believe there are a lot more pleasurable times ahead for people who take a look at your blog. I truly wanted to make a simple message to express gratitude to you for all of the precious guides you are showing at this website. My particularly long internet search has at the end been compensated with wonderful facts to share with my friends. I ‘d state that that most of us website visitors actually are very lucky to dwell in a useful website with many awesome professionals with good basics. I feel extremely happy to have used the web pages and look forward to so many more enjoyable times reading here. Thanks a lot again for a lot of things. Thanks so much for giving everyone such a nice chance to read from this blog. It is always very cool and as well , stuffed with a great time for me personally and my office colleagues to search your blog more than three times in a week to see the fresh tips you have. Not to mention, I am also at all times fascinated for the excellent opinions you serve. Selected 2 tips in this post are rather the finest I have ever had. daily. It carries good information. excellent, thank you for your efforts. content, except this webpage gives quality based writing. great post. Also, I have shared your web site in my social networks! Keep up the good work! You recognize, lots of individuals are searching around for this information, you could aid them greatly.